When it comes to a golf bag, it can tell a lot about an individual. With that said, we have covered stand bags and golf bags from Callaway, Wilson, and other different brands. However, we want to introduce a brand that is not often heard about, Ogio. Ogio is known as one of the leading brands when it comes to active sportswear and quality backpacks. With that, their expertise and craftsmanship value even extends out to golf bags. 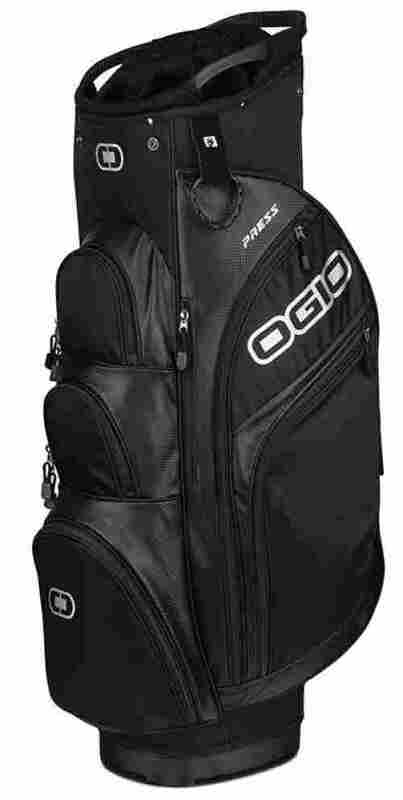 Therefore, we had to write an article about the top ten best golf bags from Ogio. Cart strap channel is high quality. Fifteen-way top for oversized putters is well designed. Valuable pocket cart strap channel. 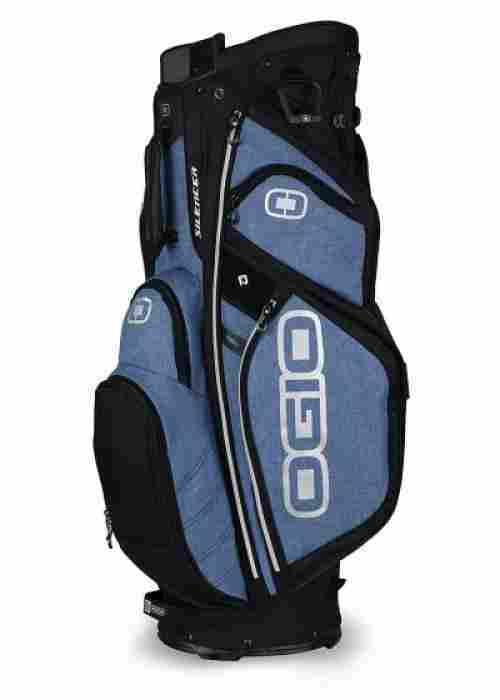 Ogio is one of the leading distributors of quality bags. Their products are not industry leading, but they are made and specialized with some of the best qualities available today. 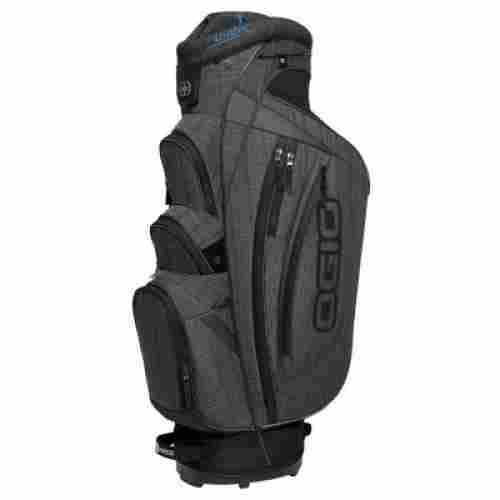 With that, we want to introduce the first stand bag from Ogio and what individuals can expect from this bag If they are considering purchasing it. This particular bag has space for seven pockets. With this, individuals can expect space for everything they need on their daily golfing adventure. Whether you want space for your golf shoes, golf balls, or even all of your clubs, this stand bag allows for plenty of space for individuals to take a lot of everything that they need. This particular stand bag has a slew of benefits that make it one of the better designs in the industry. For instance, it has two kickstands that allow individuals to easily get the bag to stand by itself. With that, it also has a fifteen-way top area that allows for oversized clubs to be separated. With this, individuals can expect that all of their clubs will be kept safe inside the bag. To discuss cost and value, it is important to note that this stand bag is designed for excellence and quality. With that in mind, you can only get the stand bag from specific sellers and the price may vary. The overall price does compete with other brands like Wilson and Callaway, but this one particular focuses all of their brand attention on developing the best quality bags in the industry. Fifteen-way club management system design. Water bottle pocket is well designed. Plenty of pocket space available. Individuals have mentioned that the bag does fall over often. Individuals have mentioned problems with the side pockets. This next golf cart bag is expertly crafted and designed for quality reassurance. If you want a water-resistant exterior with a fleece-lined interior for superior quality comfort and fit, this is the golf bag to get. There are many reasons why this is one of the highest rated items on our list and we are eager to share two important points. Let’s talk about the Ogio Golf Shredder Cart Bag and what individuals can expect from this product. The design of this stand bag is made for complete comfort and benefits. For instance, the design even has padded straps that sit perfectly on the shoulders of the individual to easily support the weight of the bag. With that, it has an organizational system that is designed for even the heaviest and oversized clubs. There are plenty of pockets, and there are different storage areas that are designed to carry equipment safely. We want to mention this feature, but it is rare that products such as this come in different color choices. If you love the design of this stand bag, the good news is that you can get it in four different colors. Whether it is an ash and blue combination or ash and red combination, the color choices are distinguished and well designed. With that, everything is high quality when it comes to this golf cart bag, even the rain added rain hood. To discuss cost and value for this product we have to consider the unique innovations as well as overall quality designs. Other than that, the system is comfortable, designed beautifully, and ensures some of the best quality performance quality and durability available today. If you want an easy way to carry around your gear, we recommend this stand bag. Deluxe features and leather accents. Integrated handles and front dual putter pit. We now want to share one of the most unique designs in the industry from this brand. The Ogio 2018 Majestic Cart bag fits perfectly with any plaid shorts and looks good alongside any golfer. This is the stand bag to get if you care about performance, value, and appearance. Here are two features to consider about this product. The value of this product is truly found in the overall design. For instance, this particular stand bag actually has a weather-resistant finish that is extremely high quality. Alongside this, this stand bag has a fleece lined valuable interior and pockets large enough to hold shoes or a laser range finder. With that said, the exterior color is high quality and made from a brown leather design that looks aesthetically beautiful. 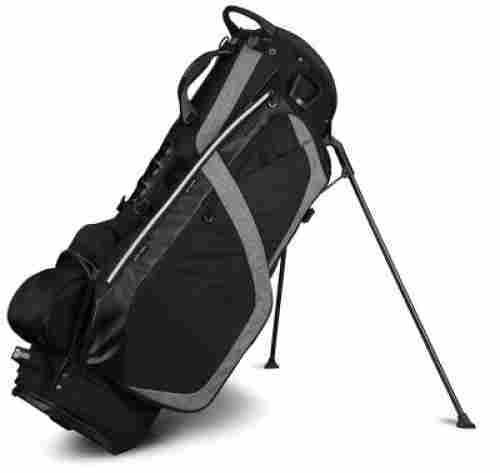 Part of the aspect of this product is that it is considered a premiere quality cart bag. The bag is made of brown leather and boasts some of the most deluxe features such as leather lined zippers as well as padded shoulder straps and five quality pockets with fleece lines interiors. With that said, the bag can hold a fifteen-way club set, making it ideal for a weekend at the golf course. To discuss cost and value for this product, it is important to note that this is one of the highest quality stand bags in the industry. Not only is it designed for quality, but it is designed with some of the best features to ensure overall durability. With that, the price is very reasonable but still somewhat pricey compared to amateur golf bags. The thing is, that this is not an amateur stand bag! Great beginner stand bag from this brand. Expertly designed and crafted for quality. This next bag is high quality, durable, and stylish but it is better left for amateurs that want a quality and durable stand bag design. This is the Ogio 2018 Press Cart Bag with a new and lower price than ever before. Here are two unique features to consider if you want this stand bag. Part of the quality of this product is that it has a fourteen-way top design. The design is easy to use, allows for easy assembly, and also protects the items off the cart bag really well. With that in mind, we can say that the product is also moisture resistant and weather resistant so less damage is done to the bag in rainy weather. Individuals have touted this brand for their quality leather materials. With that, this stand bag, despite it being for amateurs is actually made from this brands quality synthetic leather. With that, the stand bag is very durable and can easily be considered a luxury starter bag for golfers. As we discuss cost and value for this stand bag, it is important to note that the stand bag is not made to be self-standing and it does not have any secure way to mount it to a cart. With that, the design is high quality and the stand bag is perfect for the starter golfer looking for a quality design. Quality design and water resistant. Time to talk about a stand bag that is one of the most touted because of the design and the sporty look. This bag has a very comfortable and sporty appearance alongside the benefits that have made this brand highly touted. Here are two features to consider of the Ogio 2018 Silencer Cart Bag and what individuals can expect from this quality bag. One of the best aspects of this sporty bag is the pockets. The brand realized that the design of this bag was intended for wear and tear, therefore, they have designed the pockets to be highly durable and comfortable. The pockets include a fleece lined valuables pocket as well as soft close zippered pockets for easy comfort. The design of this bag is known as a barrel silencer system. Essentially, it is a fifteen-way silencer club system that ensures less wear and tear on the clubs as well as less movement that may cause them to click and clack with each other. With that said, individuals can expect the design to be comfortable to use but also allows for expert quality comfort. With that, there is even a putter pocket for an oversized putter. As we discuss cost and value, it is safe to say that the design of this bag is one of the best in the industry. Overall, it is comfortable, boasts quality features and it is expertly crafted for the professional golfer. With that, everything from the pockets to the freestanding design ensures a quality experience. 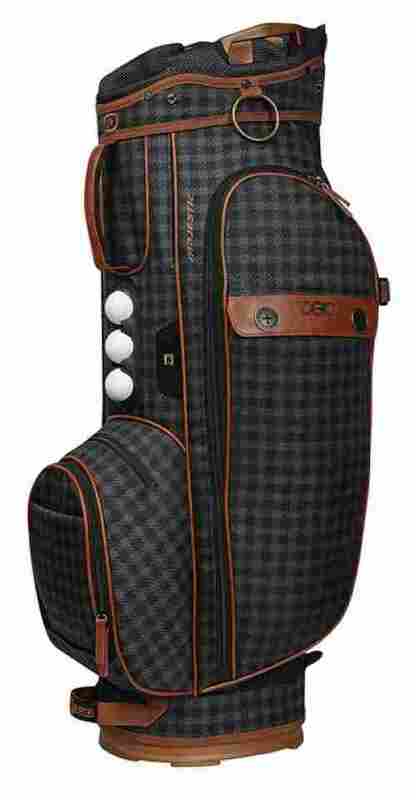 What may be even better is the sporty appearance of this golf bag. Unique design and exterior pattern. Two color choices to choose from. Six zippered pockets that are high quality. Comfortable to use and padded straps for easy carry. Individuals have mentioned the cover is bad quality. This next golf cart bag is considered one of the most aesthetically pleasing while also beautiful designs from this bag. We will say that we are in awe when it comes to the beautiful design of this bag because it is like nothing we have ever seen before. If you want a blend of regal quality comfort alongside an exception design, this is the stand bag to get. The design of this product ensures a fifteen-way top quality fit alongside a stylish appearance and quality design that ensures plenty of comfort when using it. With that, this design even has a putter well area where individuals can place a putter or oversized grips. One of the best benefits of this stand bag is the low profile design. The low profile is an easy to use design that makes it easy to reach any club. With that, the design also has padded straps, zippered pockets, and other quality features that ensure maximum comfort when using the stand bag. To discuss cost and value for this product, it is important to note that this bag is specially made for appearance and low profile qualities. With that, it is not as high quality as their other expert products but for the price, it is still considered a high-quality stand bag with plenty of quality features. The design is beautiful and the bag is durable, making it a great gift as well. Seven-way holster performance top design. Quality fabric that is moisture wicking. This next stand bag is made for individuals that want a lightweight and skinny design for a quick game of golf. If you want to easily take your clubs with you to your next tournament, we recommend the Ogio 2018 Cirrus Stand Bag because of the many quality benefits that it has. Here are two feature benefits of this stand bag. The design of this stand bag is made to be lightweight and easy to carry. It even comes with a walking-accessible water bottle holster that is insulated. With that, much of the extra weight has been taken off and many of the extra features are nonexistent because the primary design is to make it easy to use and easy to carry. The design of this product is made to be a seven-way holster performance top that ensures a better quality carrying experience. With that, the putter put and integrated handle make it easy for individuals to carry their most important items on a moments notice. If you want a stand bag that allows for a quick game of golf with your favorite clubs, we recommend this bag. Although this product is considered a lightweight and carry bag alongside starter features, the price actually matches what normally priced stand bags would be. In fact, the price can be a bit costly. But, it is because the bag is still made for quality. Overall, the stand bag is made to be highly durable and even has areas that are supported by quality materials where traction may be more frequent. Five way top divider design. Six pockets for easy access. Water bottle holster that is insulted. This next golf club stand is designed for quality comfort and for an easy carry experience. Although it is considered more of an amateur stand, it still has a slew of quality features that individuals will appreciate as part of the design. The Ogio 2018 Press Stand Bag is the perfect bag if you want distinctive features and a visually appealing and minimal design. This stand bag has quality features. The first of the features is the free-standing design which allows for easy access to the clubs. With that, the seven-way top performance design allows clubs to easily be separated. Although it is not a full set of clubs, the clubs that an individual does take will be well taken care of and safe. It seems that pockets are a common and universal trait when it comes to stand bags. This stand back comes with six different pockets that allow for full use of the bag. With that, there is a valuable pocket as well as an easily accessible water bottle holster. With that said, the velcro glove attachment makes it easy to place, set, and use. Individuals that want an easy to carry and simple design will appreciate this stand bag. The overall value of the bag is designed for effortless carry as well as plenty of space to easily carry all items. With that, the design is not as premiere as we have come to know from other stand bags but it is highly durable and constructed well. Premium stitching for better durability. We are coming close to the end of our list and this next stand bag is a quality designed bag for comfort and quality. This is considered a more premiere bag design due to the fourteen-way diamond top alongside the full suspension system and easy low profile design. With that, there are even more features to consider of the Ogio 2018 Grom Stand Bag. Here are a couple of features to consider! When it comes to premiere stand bags, the design and material quality will be one of the best. This stand bag, in fact, is made of a weather resistant material that allows for the stand bag to function effortlessly and perfectly in all weather conditions. With that, it will not get damaged if it gets a bit of rain on it. This stand bag has one of the most simple features that is also considered one of the most beneficial. The stand bag has ball pockets that make it easy for individuals to access the golf ball and use it on the course. Alongside this, the zippers and pockets are well designed, allowing for enough space for individuals to take along any product that they may need on their course. To discuss cost and value for this product, it is important to consider that this is one of the best-designed stand bags from this brand for the overall value. The cost can be compared to higher grade stand bags while also having a sporty design that allows it to be highly usable and durable. With that, the exterior has some of the best qualities that an individual can expect from a stand bag. Eight pockets for easy carrying. Durable stitching and reinforced zippers. As the next stand bag on the list, the Ogio International Ops Cart Bag is a well-designed bag that has plenty of comfortable features and is also relatively affordable. It is designed like a military product, with an American flag design that patriotic golfers will appreciate. Let’s talk about the Ogio Internation Ops Cart Bag and what individuals can expect from this product. This stand bag is designed with eight pockets, all ranging in size. With that, individuals can expect the design to be both durable and also comfortable to use, allowing for the easy carrying of almost all items an individual needs. The pockets are durable, comfortable to use, and stylish overall. The style of this stand bag has a fifteen-way club management design that makes it easy for individuals to access their clubs and order them in a safe manner. With this, individuals are guaranteed that their clubs will not hit each other or will get damaged upon transfer. Let’s discuss the cost and value of this product. Not only is it well designed and has a unique exterior pattern. It also is made to be high quality and perfect for both amateurs and seasoned golfers. If you want a well-designed stand bag with plenty of space, we recommend this one. Considering the price is relatively low, we recommend it to individuals that want plenty of design qualities. The design of the bag is one of the most important key factors to consider for many different reasons. We made this a key factor because we wanted to ensure a wide variety of different stand bags. We first wanted to narrow down our research to the best bags by this brand and then pick the top ten best based off of our guidelines. As guideline number one, we found that the design of these bags is very different than many in the industry. These bags are made to be modern and minimal looking. Although, minimal appearance does not mean that the product lacks in the feature department. With that, the designs of these bags include neutral color tones as well as color designs and textures that feel smooth and durable. The designs include sleek lines, no logos, minimal texture qualities, and a smooth and refined appearance that one would expect from a luxury bag. With that, it leads way into the next criteria. When taking this brand into consideration, we found durability to be a crucial factor for many different reasons. First, we wanted to ensure that the design or beauty of the bag was not causing the durability to be sacrificed. We found the complete opposite. This maker designs their bags from some of the most durable materials in the industry and includes specialized durable features. You always want your golf equipment to be strong and durable so it will last you a long time, and not rip or break easily. We wanted to make sure that the bags we included were durable so you wouldn't waste your money on something that wouldn't last. Padded straps that are reinforced stitched. An easy club management system. Reinforced bottom for club protection. A rip-stop exterior that is easy to clean. These are only a few of the common features we noticed their excellent products include. As the last criteria that we took into consideration, we found it important to look into the price of the product for the value. The reason being is that we notice that a large selection of the product from this brand are actually affordably priced. In fact, many of the bags that we have shared are priced around the same range as a traditional amateur Callaway golf bag. With that, we found that it was important to share and take into consideration a large variety of bags from this manufacturer so we can fulfill a large consumer base as far as designed and benefits. Capacity is the most obvious criteria we looked at but still quite important. How much or how little the golf bag can hold determines what bag you're interested in. Some people want a larger golf bag with extra pockets to hold anything and everything they might need out on the golf course. Other people just want a simpler bag to hold just the bare necessities. Most important thing you want to look at is how many golf clubs the bag can hold to determine if that bag is big enough for you. Next thing is how many pockets there are, how much they can hold, and how big or small they are. Once you determine how much you need to bring with you on the golf course you'll have a better idea of what size bag you need. Some things that are going to come in handy while out on the golf course are: new and old golf balls, tees, sun screen, bug spray, a pen or sharpie marker, at least one water bottle, rain gear especially an umbrella, towel, ball markers, and multiple golf gloves. Those are pretty much the necessities when golfing, but you might also want to pack a first aid kit if you have room because you never know when that will come in handy, and a light snack. You might be wondering why I included bringing a sharpie marker with you on the golf course if you're new to golf. When you're playing golf at a golf course where there is a lot of people it's easy to get your ball mixed up with someone elses and then you're left not knowing whose ball is closer to the green. If you mark your golf ball with you initials or a distinguishing mark you'll always know whose ball is whose. Another thing that comes in handy that you could bring that's cheap is on the go golf club cleaner and golf ball cleaners. Some courses may get muddy and will stick to your golf clubs and your ball., and having these cleaners with you will prevent the mud from intervening with your game. One last thing we looked into is the portability of the golf bag. Was it easy to carry? Was it heavy? Some of the straps it comes with have a nice padding on it so provide added comfort so it's not so rough on your shoulders. Some golf bags have stands on them which makes playing golf with them much easier. A lot are designed to be lightweight because once you put the golf clubs in the bag it's going to get heavier and heavier. Finding a way to make the golf bag lightweight yet durable can be tricky, but they somehow found a way. So, we went through and found some great choices to choose from so we hope you find the perfect golf bag for you. q: Does the bag come with a rain hood? As one of the main questions that individuals are taking into consideration, we found that many of the golf bags on this list do come with a rain hood. As this brands dedication to produce quality and trust among customers, many of the bags we have shared have some of the most basic features that individuals are asking for from their bag. q: Can it attack to a cart? This question is mostly relative to the design of the stand bag. Most stand bags have a bag band design that allows individuals to easily attach it to a golf cart. With that, it is important to note that some of the bags above do not have a golf cart attachment system. Therefore, it is best to take into consideration the details of the bag if that is an important quality. q: Is the exterior waterproof? Although the exterior of a stand bag is water-resistant and moisture wicking, it is never fully waterproof. Some of the bags we have shared are made from synthetic leather, nylon, or polyester and they boast quality moisture-wicking benefits. With that, individuals are guaranteed a quality bag with a rain hood included protecting against the weather elements. q: How much does a typical stand bag weigh? This question varies depending on the brand and the stand bag design. However, a standard bag made for fourteen clubs will weigh between 5lbs to 6lbs. With that, a bag with a seven-club design and fewer pockets will weigh around 3-5lbs. It is important to note that the weigh will also increase once more clubs are added to the golf bag. q: How do you clean a golf bag? This is a great question and one of the most common. If you discover yourself needed to clean your golf bag, then it is important to clean it with a moist and quality towel. The towel can be damp and used to wipe down the exterior of the bag. With that, bags from this company are resistant towards dust and water. q: Are the straps padded? As the last question that most individuals are asking, the simple answer is yes. It would be highly uncomfortable to have to carry around a golf bag that does not have padded straps. With that, all of the straps this brand makes are padded for comfort and double stitched for durability with some of the best materials in the industry.